With the introduction of the Sony Z1 smartphone (at right) and QX10 and Q100 "lessors" (below) at IFA today, we have yet another step forward by phones that encroaches upon compact camera territory. 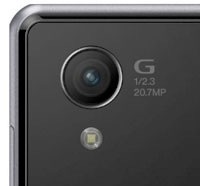 The Xperia Z1 is a 20mp 1/2.3" sensor with a Sony G 27mm f/2 lens in front of it. And oh by the way, it's waterproof and has an open SDK. We're now clearly in the image quality territory of all but the largest sensor compacts. 1/2.3" BSI was about the top of the line for compact cameras until we started seeing the large sensor ones start to appear. Now you know why we're getting large sensor compacts: the camera makers are trying to stay one step ahead of the smartphone makers. Curiously, Sony is racing themselves. The Z1 uses the same sensor technology as some of their compact cameras. While the RX100II's somewhat larger sensor keeps it ahead of the smartphone by a stop or two, it seems clear that it's the zoom lens on the compact camera and the ability to shoot raw that are the most defining features that have kept it slightly separated from the ever better phones. But are those things enough to justify buying a US$750 camera? More interesting is the dichotomy between the Z1 and the WX300, which uses the same image sensor as the phone. The WX300 is one of those "superzoom" compacts, with a lens that is equivalent to 25-500mm. But it's also f/3.5-6.5, so here's an example where at the equivalent shooting, the compact camera is actually worse than the phone (by about two stops). So Sony's betting that some want focal length choice (and some additional features) over low light, low noise choice. It'll be interesting to see how that plays out. If the Z1 weren't enough, we've got the QX10 and QX100 lens+sensor combos to deal with (I call them lensors ever since Ricoh came up with the lens+sensor packaging). These are essentially the guts of Sony's compact WX150 and RX100II cameras without an LCD or control system. Wait, no control system? Yes, you basically hang these things on the back of your cellphone and control it from the phone's LCD using a PlayMemories App. Curiously enough, Sony gave us a preview of this in the RX100II. If you go to the SHOOTING 1 menu at the bottom you'll see Ctrl with Smartphone. Basically this function lets you pair your RX100II with your smartphone via WiFi, then use the Smartphone to perform most basic features. It's essentially a nascent version of what became the QX100 (just leave off LCD, most of the controls, the flash, the hot shoe, and so on). One thing that's a bit of a downer with the QX100 is that the lensor doesn't fully retract: basically the whole QX100 unit is almost the same depth as the RX100II with its lens mostly extended, so it's not nearly as compact as you'd hope. The QX150, which is based on a different camera and lens, is smaller. Both models have some lens retraction when not powered, but a smartphone coupled with the QX100 is virtually the same size as some NEX cameras (though the smartphone body is thinner). This, I think, is a bit of a problem for the concept. And we don't know the battery life of the lensor module; the RX100II's battery life is already on the low side. Sony seems all-in on the QX idea. They'll have additional models in the 2014 time frame. Not only are they doing this for their own phones, but they're supporting most Android and iOS phones (and theoretically, tablets, too). By supporting, I mean more than just an App: Sony has a case for the iPhone that serves as a "lens mount" for the QX module, removing the juggling aspect that shows up in Sony's promotional videos. But some of that juggling is good: you can separate the lensor from the smartphone, allowing selfies, hi/low angle shots, shooting around corners, and more. Still, it's juggling: you've got to control the smartphone with one hand (so much for those phablet designs) and the QX module with another. Alternatively, the QX module can be used as a detachable camera (without viewfinder) if you want, but I just see that as mostly random shooting, as you have no easy way to know what's being framed unless you actually look at the phone, and then you're back to juggling again. QX10 — US$250. Same 1/23" BSI 18.2mp sensor and 27.5-275mm equivalent f/3.3-5.9 lens as the now discontinued WX150. QX100 — US$500. 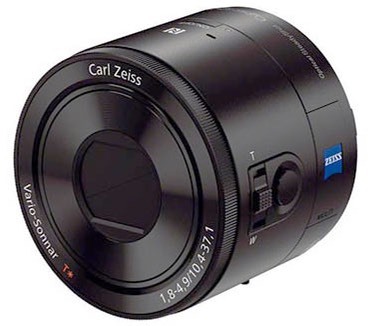 Same 1" 20mp sensor and 28-100mm equivalent f/1.8-4.9 Zeiss lens as the current RX-100II. Both — WiFi, NFC, tripod mount, microSD slot, in lens stabilization, BIONZ processor, stereo mic, contrast detect AF, plastic body material. 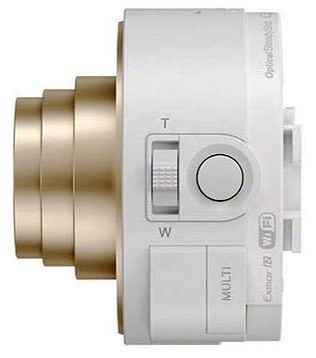 If Sony lost all their Powershoot customers to the i1 smartphone and/or QX modules, I doubt they'd be too upset, especially if their phone could sell in the kinds of volume that the iPhone and Samsung phones do. Sony's compact camera market share has collapsed in the US, for example, down to less than half that of either Nikon or Canon. Sure, it would mean some internal jealousy within Sony, as the phone development is not exactly the same as the camera development, but it would still be a Sony win. But what about Canon and Nikon, who have no phone divisions? Nikon, for example, sold over 17 million Coolpix in the last year. While Nikon doesn't break out the exact sales number balance between compacts and DSLRs, using CIPA average sales price data for both categories with Nikon's unit volume shipped, calculating from a variety of sets of data, I see that Coolpix is down to around 20% of Nikon's camera sales (in overall dollars). If that goes away, Nikon's camera division—which is itself about three-quarters of the company's sales—would shrink by about a fifth. The race to come up with models that will continue to sell well against the smartphone onslaught is going to be a tough one for Nikon. Ditto for Canon, who are in a similar situation with their Imaging Division. So one question is whether Nikon could do the same thing as Sony. Sure. But let me tell you, what I've seen of Nikon's phone apps so far, Sony seems much further along at getting a full and useful program on iOS and Android devices (though Sony still has a ways to go to get their app where it should be, IMHO). The US$100-300 compacts will continue to decline rapidly, with continued 50%+ unit volume drops annually. The camera makers had assumed that third-world and emerging markets would absorb lots of low cost cameras, but those markets are buying phones with cameras in them just like everyone else, and they're not likely to buy multiple devices to do the same thing. The US$300-500 compacts used to be the ones with the 1/2.3" sensors in them, but we're getting phones and lensors that compete with them. This, too, will be a rapidly declining market, and may approach the 50%+ unit volume drops of the lower end of compact cameras. The US$500+ compacts are currently all large sensor compacts, the least expensive of which is currently US$650. That's DSLR and mirrorless camera price territory. If the large sensor compact can slip into a pocket, then maybe it can find a spot between the closing walls (smartphones on one side, mirrorless on the other). But that's a pretty narrow segment, I think. Moreover, the more you try to do with the large sensor compact (e.g. the Leica Vario X), the more you're just competing directly against a darned good mirrorless camera (the Fujifilm X-E1 with the 18-55mm f/2.8-4 kit lens in the Vario X's case). There's a perceived advantage to buying an interchangeable lens camera, even if you don't initially take advantage of that (i.e. always use the kit lens). And the return of the lensor concept from Sony also plays into this. So I'm going to take back my headline: this isn't a race, but more of a demolition derby, where all the camera makers are in an arena whose walls slowly move inwards, each of them crashing into each other trying to get some extra space of their own and get the others out of their way so they can maneuver better. Last one standing wins. The problem, of course, is that the switch to digital made all the camera makers suddenly think they were consumer electronics giants. Digital camera sales far exceeded film camera sales. Everything looked like "up" to the camera makers, which is why we had so many of them making so many variations. I don't think that it's a coincidence that Leica is making a profit and experiencing a comeback. They don't seem to think they're a consumer electronics company. They think they're a high-performance camera company. Their customers aren't the mass market consumer, they're photographers who know what they're doing and what they want. They don't need a huge number of those to make money. Moreover, it isn't tricks, bells and whistles, number of features, or even more megapixels that propel their sales. Rather, it's the overall performance of the product and dedication to task. As the demolition derby continues, Leica has brought a couple of tanks to supplement their more consumer-like offerings. They'll be hard to displace or eliminate as a competitor because of that. The others need to take note: solid, built-to-purpose, high-performance, well-maintained and supported products are what will be left standing at the end. Meanwhile, hundreds of millions of plastic, poorly made, low-end, mass consumer compact cameras are all headed for landfills. Meanwhile, we have to contemplate Sony and the way it is all over the board. Smartphones, compact cameras with small sensors, compact cameras with large sensors, lensors, mirrorless (apparently in multiple sensor sizes, and already split between some that still cameras, some that are video), DSLRs then SLTs, and next yet another variation. And don't forget their GoPro knockoff. Sony shows all the signs of trying anything and everything in order to get some traction in the camera market. But I'm having problems reconciling their many thrusts. Many of them will fail, I think. The RX100II versus QX100 is a very good example of that. Both pair nicely with smartphones. Both have the same lens and sensor. Both are expensive. One will steal sales from the other, and I'm betting that it's the RX100II, not the QX100, which seems much more "novelty." Why would a smartphone user buy the RX100II over the QX100? Well, because it doesn't have to be paired to be used as a fully functional camera. But then again, that makes it a bit more removed from the workflow of the PlayMemories app: you'll still have to pair the RX100II to get your images over to the phone in order to move them where you want them. Imagine getting a phone call while trying to compose with the QX100. Don't laugh. It will happen. So will SMS message notifications and a bunch of other things. The handling of the smartphone going from "camera with lensor" mode to "something else phone" mode will be important, and it looks a little kludgey to me in its current form. Still, Sony's thinking out of the box. Many camera makers are still designing boxes to put compact cameras in. Sony won't win all these battles, because many of them are with themselves. What they're more likely to do is help others discover what the real solution is. To pre-order the QX-10 (about pre-orders) click this advertiser link. To pre-order the QX-100 click this advertiser link.